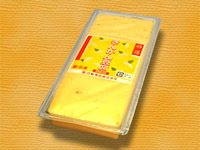 Ready to eat Frozen Flavored Kawari Tofu (hotel restaurant use). 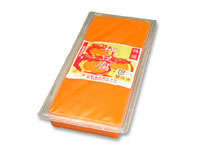 The magnificent color of the tofu will enhance the seasonal presentation of appetizers and desserts. Cut semi-thawed. Tasty Sesame-Tofu blended and kneaded with aromatic buckwheat seed. 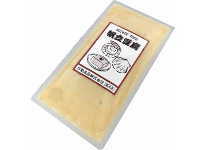 Excellent nutty flavor of Roasted Sesame.Experience this new Sesame-Tofu with the nutty aroma of roasted sesame and chewy texture of Sweet Rice Flour. 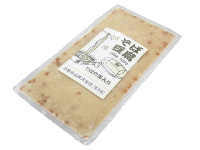 We use special paste made from carefully roasted sesame seeds that gives aroma and thick taste like no other. Perfect for early spring appetizers. 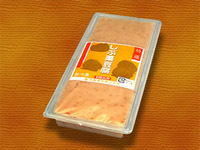 This is Frozen type Sesame-Tofu with chewy texture. 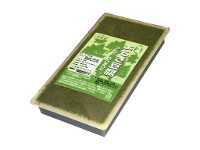 We have blended plenty of Yomogi herbs for the aroma and taste. 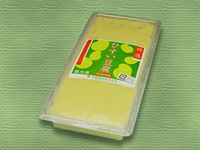 Frozen type Sesame-Tofu in summer Edamame flavor. 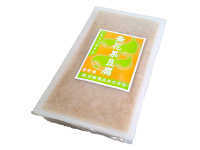 Enjoy the chewy texture of Sweet Rice Flour. 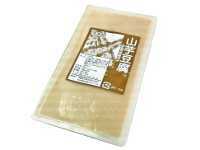 Flavored Tofu kneaded with high quality walnut. 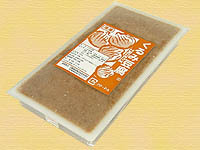 The blend of walnut and Miso Paste brings out the rich aroma and taste. Sweet Rice Flour is added for the chewy texture. 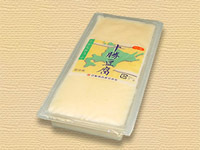 Milk and Butter flavored soft tofu. A classic appetizer that goes well with wasabi soy-sauce. 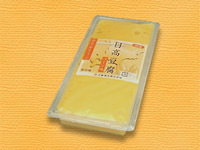 Enjoy the sweet aroma and taste of this Flavored Tofu, made from sun soaked summer corn. The natural sweetness is suited for dessert as well. 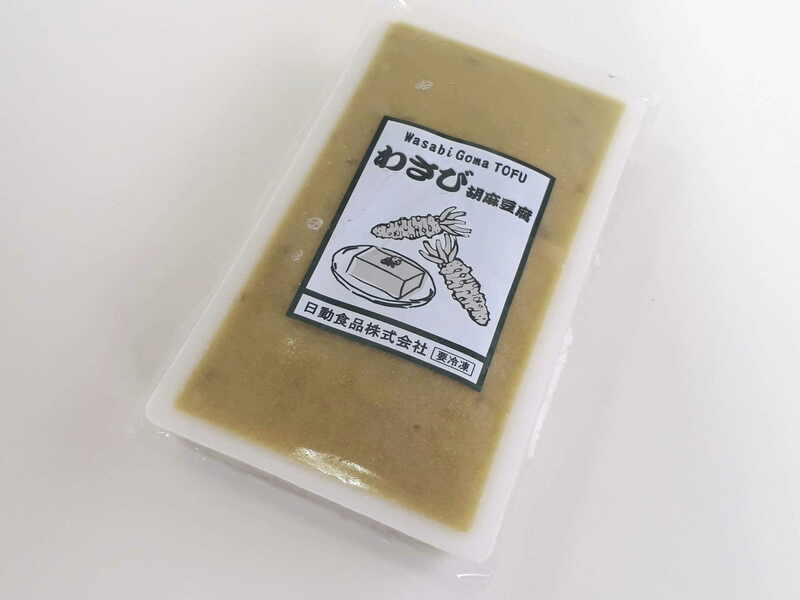 You may heat the Tofu to melt and mold in the pan of your choice. Persimmon colors are perfect for autumn. The natural sweetness of the fruit is also enjoyable as dessert. 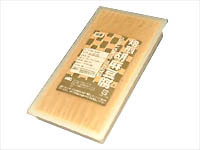 You may heat the Tofu to melt and mold in the pan of your choice. Enjoy the aroma and sweetness of Autumn Chestnuts steeped in liquor. Recommended as desserts for the autumn season. 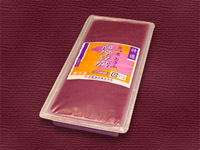 Enjoy the natural taste of Murasaki Imo (Purple Sweet Potato). The light purple color is also suited for Buddhist memorial occasions. We use plump and round whole kumquat and cut chunks. The bitter, sweet, sour aroma and taste will make a delightful dessert for the autumn-winter season. 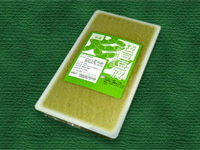 Products on this page are for Hotels and Restaurants use only. Copyright 2017 Nichido Foods Co.,Ltd.